Individually hand assembled, the arco clip hook brings an elegant and ingenious solution to the age old problem of the bow's safe and secure storage during prolonged pizzicato passages, one which also affords quick and convenient resumption of arco playing. New for 2016 - Mk.3 version! The hip alternative to in-performance bow storage for the bassist has upgraded materials and manufacture processes. As previously, the Arco Clip Hook can of course be used in its original way - clipped onto a belt or waist band, allowing the bow to be held securely to the player's side, 'sword style'. Alternatively it can be opened out to allow the hook to hang down from the clip as it attaches to a horizontal ledge (typically the ledge of a music stand). Thus the bow can be conveniently stored right in front of the player if desired. Starting with two pre-made components (the hook and the spring-loaded clip), each Arco Clip Hook is then individually hand assembled with great care, now with the barrel hinge made from plastic (formerly it was hardwood and heatshrunk rubber sleeving). Also, it has been possible to source hooks that can be screwed in place, obviating the need for resin glue. The bow retaining hook is metal and covered with glassfibre braided cloth and rubber, protecting the bow's frog. The hook also terminates in a rounded metal ball, shrouded in rubber and so there's no danger of encountering a sharp edge if making a hurried grab for the bow. The hinge assembly now moves a little more freely than it did before, the friction of rubber on plastic (with the mk2 version) proving to be less necessary than originally thought. View the illustrated Instruction Leaflet here. In its closed position the clip can be fastened at your side, to a waistband, an appropriate belt, or otherwise opened out and fastened to the ledge of a music stand (or similar). 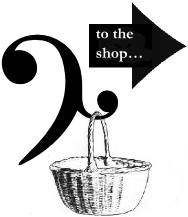 The bow can easily be placed on the hook when it is not needed, leaving the player free to play pizzicato, retrieving the bow quickly and easily anytime it is needed again. The tip of the hook finishes in a rounded metal ball-end, and is further shrouded in a rubber sleeving, so there is no sharp point to be worried about. Equally well with any type of bass bow. 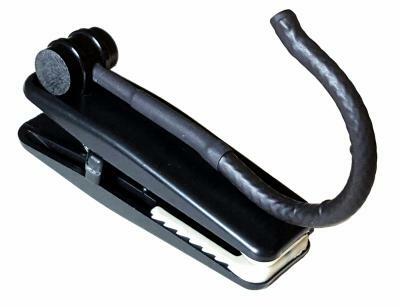 The arco clip hook can also be used for violin or viola players, if they stand to play. Those who sit to play (and this includes cellists) may find that the bow will contact the floor when placed on the hook, as when seated, the distance from a player’s waistband (or belt) to the floor is likely to be less than the length of the bow itself. 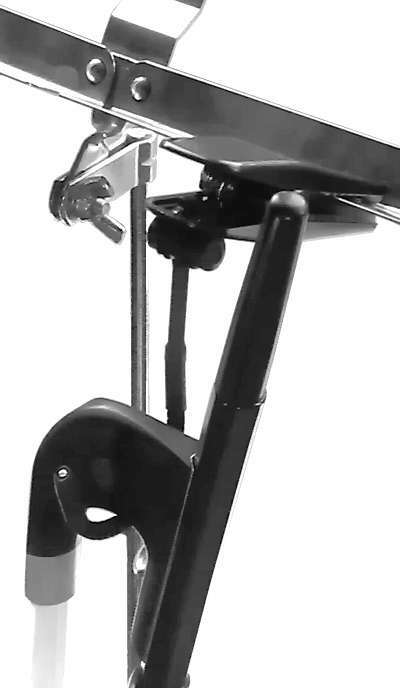 Similarly, using the clip hook on a music stand for a seated player may also mean the stand is too low, allowing the bow tip to contact the floor. The new version is technologically much more involved, taking a lot more time to manufacture and therefore the labour cost is considerably higher.